To find out more about Somerset County Golf Union click on the logo. 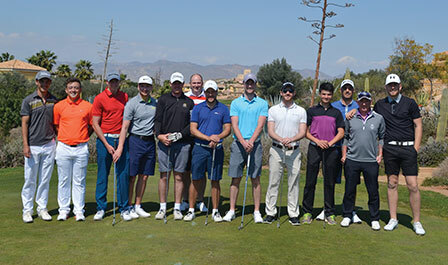 Somerset Golf Union Performance Manager, Russell Covey accompanied twelve players from the Somerset Golf Union aged between 16 - 55 years for 7-days of warm weather pre-season winter training at the Desert Springs Resort between 08th – 15th March. “The relationship between the Somerset Golf Union and Desert Springs goes from strength to strength. In 2016 we have had our best trip to date! The golf course is in fabulous condition and the staff are second to none. The training camp utilised the excellent practice facilities at the Desert Springs Golf Academy where Russell Covey was able provide one-to-one tuition to the team members and take advantage of the use of the Desert Springs short game academy prior to the players embarking on their rounds on The Indiana course. “What a golf course, you simply have to play it! Those were the comments received from Somerset Golf Union team members Jonathan Grace and Phillip White respectively. 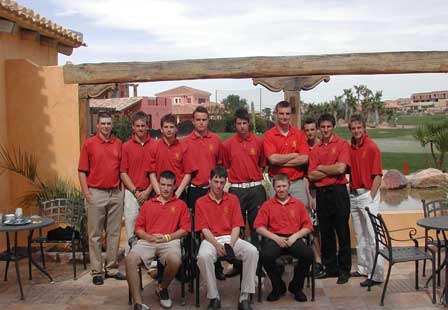 The players were accommodated in some of the privately owned apartments normally reserved for holidays and short breaks at Desert Springs and the resort’s executive chef was on hand to cater for the special dietary requirements of individual players dining each evening in the ‘El Torrente’ Restaurant. Somerset Golf Union at Desert Springs Resort for their Annual Winter Pre-Season Training Camp. Now we are back to the English Spring- windy and raining certainly no weather to play golf. We must say how much we all enjoyed our visit to your resort, and when each and everyone of our group was asked would they come again next year if invited, they all replied without hesitation "yes please"! Most asked us to arrange to stay on site next year rather than at the hotel in Mojacar, principally so that they spend more time using your terrific practice facilities. We agree that this would be the best arrangement and we shall talk to you later in the year to start the arrangements for this. understanding and helpful. The catering staff treated us very kindly too and this we appreciated also. With very kind regards from us all!